The NKJV Cultural Backgrounds Study Bible, with notes from Dr. John H. Walton (Wheaton College) in the Old Testament and Dr. Craig S. Keener (Asbury Theological Seminary) in the New Testament, brings to life the ancient world of Scripture for modern readers. 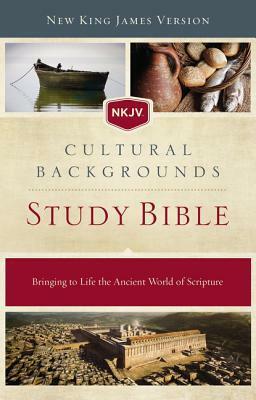 I’m so excited to have a chance to review this Bible, the NKJV Cultural Backgrounds Study Bible. I’ve been looking to add something like this to my collection of Bibles, mainly because well, there are a lot of cultural references in the Scriptures that I’m just not familiar with. But, through sermons and personal Bible study, I’ve learned that sometimes knowing and understanding these references can really help to make the Bible more understandable and more applicable to my walk as a Christian. So what kind of things can you find in this study Bible? In my first flip through, I was finding a lot of pictures. Some of them are various artifacts that are relevant to passages. For example, there might be an image of a jug that has images of someone playing a harp. With it, is an explanation of the types of harps that existed in the time. Harps or music are also mentioned in a nearby passage. Or modern day images of places mentioned. There are also explanations of things such as dowries or what a certain phrase might mean. There are maps sprinkled throughout showing things like David’s journeys as a fugitive, a map comparing the key events in the lives of Elijah and Elisha, Paul’s missionary journeys, and plenty more. Introductions of each book of the Bible tell about the book. These explain key concepts, who wrote the book, when it was written, and any other relevant history or facts about it. And mixed in with all of this are other charts and tables. Overall, I am impressed with this Bible and I’m looking forward to using it in my personal Bible studies. My personal copy is a hard cover with a dust jacket. Under the cover, I was pleased to see that it was fairly plain—there is a leather texture printed on that mimics the look of a plain leather Bible. If you are looking for a Study Bible that might help you understand a bit more about the cultures surrounding the Scriptures, check this one out. It may just be what you are looking for.